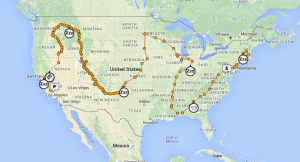 Ground Pounding Extremes: He Traveled to 48 States in 7 Days!! At the Victory Store in Chicago. 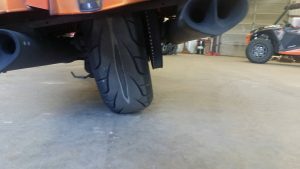 In the first article of the Ground Pounding Extremes series, I introduced the word ground pounding and defined it as a term meaning: riding your motorcycle for extended [distances] over a period of time. The article narrated the journey of four men whom rode their motorcycles to 48 states in one trip, completing it between 9-13 days. Though their accomplishments were quite impressive, I was amazed at hearing that there was someone who had completed a similar trip in only seven (7) days. 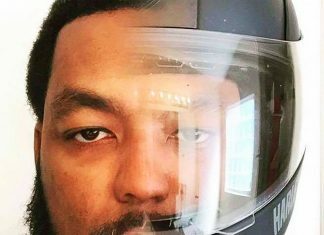 I spoke to Young Blood of Black Lyfe MC (Virginia Chapter). He provided a personal insight of his trip and how he was able to successfully complete such an extreme accomplishment. His interview is below! GY: Hi Young Blood, so as you know, everyone is amazed at the fact that you completed riding to 48 states in just 7 days. I want to know how were you able to accomplish this. Young Blood: It was actually 7 days and 9 hours to be exact. GY: Where and when did you start your 48 state-run? Young Blood: I started my 48 state-run from Virginia immediately after work around 4:30pm on June 14th and ended the trip in California. GY: How did you plan the route and the stops you would take? Young Blood: I researched on what would be the fastest route and then made that route fit my plans. 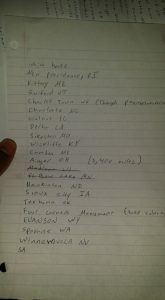 I knew I wanted to do the 48 states but I also wanted to end the trip in San Diego California for Black Lyfe MC annual. After finding a route and making it fit my plans I checked and rechecked it again. I even made some last-minute changes on the fly. Some were good choices others turned out to not be the best decisions (ya live and ya learn). 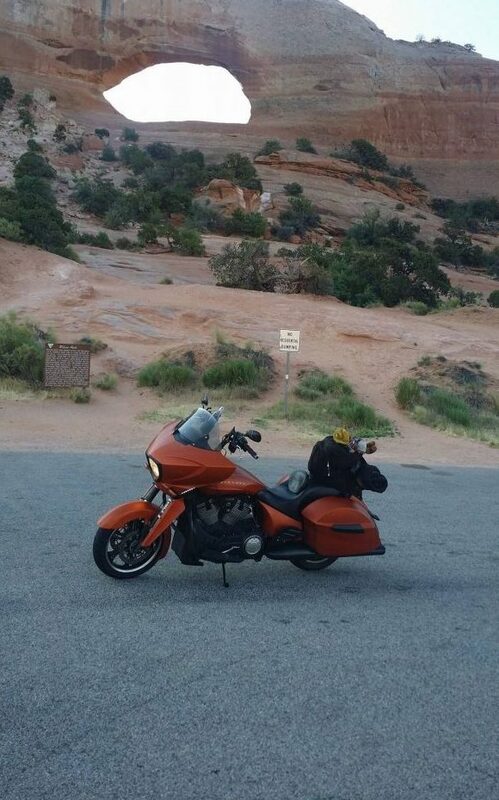 I never planned a stop because I was told “if you plan to stop in a city no matter how much energy you have before that city when you get to that city your body will just give up on you and want to shut down“…….so never plan to stop just ride until you are ready to stop! GY: How were you able to complete 48 states in 7 days and 9 hours? Young Blood: I wasn’t really riding for a time. I just knew I didn’t want to miss the Black Lyfe MC annual and I wanted some time to rest before the event. I also gave myself some break down time. If anything was to happen with the bike I could get it fixed and keep it chopping. GY: How much sleep did you get on this trip? Young Blood: I got plenty of sleep, but I’m used to working all day with little sleep. I got a hotel a few nights, one night being due to a storm in Roanoke, VA. I slept in a rest area in Vermont for about 45 minutes one night, and another night I slept on the ground at a Loves gas station until the sun came up. I got maybe 4 to 5 hours of sleep when I got hotels. Cities he plugged into GPS! GY: What motivated you to do the 48 states, in such little time? Young Blood: I wanted to put Black Lyfe MC on the map. To make a real statement and that being “we ride ours.” I saw King M&M (Cell of Kingz of the South) doing videos and he brought up the Yonda movement and right then and there I knew how I could put on for my brothers. I saw Reef (Chosen Few MC) and Smiley (Kings of Cali MC) complete their 48 states last year and I thought to myself, I could never do that. After making my first big trip in April, with over 8,800 miles Reef was talking to me about hitting 48 states to get the Smiley Red Star patch, which at the time I had the 24 state 1 trip patch so I was like bet I’m going for it. GY: What were your total number of miles? Young Blood: A little over 7,600 miles to reach California, not including the miles it took me to get back to VA from Cali. GY: What items did you take as necessities to complete your trip? Young Blood: I had a small tool bag that I personally put together just in case something happened. I had a tire plug kit with tire slime and a compact air compressor. I also took an extra credit card which I placed on the bike at all times just in case I lost my wallet. I took a cup holder and phone holder which I attached to the bike and a few maps just in case the GPS stopped working. GY: How was the weather? Young Blood: I was blessed with amazing weather the entire ride. I got a slight sprinkle coming back home in Oklahoma but luckily never hit any serious rain. Just a lot of windy areas which had me leaning off my bike, thinking I was about to be blown off the road. It was 120 degrees in Yuma, which had me seeing men on the side of the road that weren’t there. All I have to say is that it is best to travel at night in the desert. GY: What kind of support did you have to complete your trip in such little time? Young Blood: It’s wild how much support you get on the road from complete strangers. I received great advice from legends before I even started my trip. When I was on the road Hooch Ryders MC put me up in a hotel after escorting me into Memphis,TN. I was pulling into a gas station ready to sleep on the ground after a long day and ran into them in Jackson, MS. They didn’t want to leave me there so they asked if I still had some ride in me since I was about an hour and 30 minutes from Memphis. I was dead tired but they didn’t let me quit and provided a quick pound up to Memphis, TN. 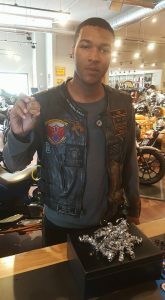 I grabbed the Have Iron /Will Travel discount from Big Rob of Nexx Dimenzion MC out of Chicago which I just so happen to pick the dealership he worked at and he noticed my patch and introduced himself….he’s cool peeps! Oh and in Kansas, a random girl named Kelsea started knocking on random people doors to help find me an oil pan so I could do an oil change on a Sunday because all the shops were closed. The support system on the road is just amazing and I want to encourage everyone to see that for themselves. Picture of Young Blood tire! GY: What kind of issues did you encounter during your trip? I found out on a Monday I needed new tires and the shops were closed because it was Monday. So I had to push 80 miles to get Sharps Motorsports in Amarillo, TX while my thread was already starting to show. The techs there found my rear axle had seized due to lack of lube from the last tire change but they worked their magic and got me back on the road. I guess I came in the middle of their lunch cause right when the tech got done he grabbed a hot dog and just went to work on it. That’s when I realized if your tech has to wash his hands before he eats you might want to go to another tech ’cause the best techs do not care about washing hands….they just go in (lol). GY: What was the most memorable part of your trip? Young Blood: I would have to say the whole trip. Just being in places I’ve never seen or heard about. Meeting new people and sharing our different stories. I feel like that is something I’ll never forget. When Young Blood is not pounding the ground, he is helping protecting our country as a member of the United States Navy! 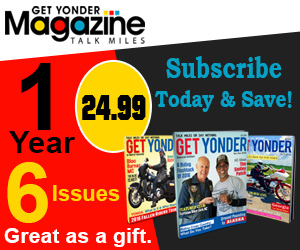 Young Blood is also a two-time winner of the Get Yonder Miles Challenge! Hashtag: Beat Cancer Then Ride!